Simply put, FUNAAB has achieved the primary objective of the World Bank by establishing a Centre of Excellence to train the next generation of West African scientists in Agricultural Development and Sustainable Environment. The gains of the Centre are simply unquantifiable. CEADESE programmes have evolved within limited time of its existence as specialised programmes of choice among the post graduate programmes in FUNAAB. Students’ enrolment has, till date, reached about two hundred (200) postgraduate students from Nigeria, Togo, Benin, Liberia, and the Gambia. CEADESE Students have demonstrated very rare excellence, as attested to by the World Bank, and this has earned them prizes and awards. Scientific Publications from CEADESE research activities have yielded more than 200 publications mostly in high impact journals. The six Masters and six Doctoral programmes in the Centre have all been fully accredited by the National Universities Commission with scores ranging from 74.8 % to 94.5 %. At the moment, the Centre is getting set for the international accreditation of its programmes by the German Quality Assurance System (AQAS), slated for November 2018. One major source of attraction is postgraduate internship. CEADESE students have visited 42 internship locations within Nigeria, Benin, Togo and the Gambia. This has ensured demand-driven, innovative, industry-oriented and impactful researches which have yielded innovations, models, new varieties, and solutions to critical issues of developmental and environmental sustainability. Graduate Employability has been remarkably impressive. Output tracing has shown that more than 70% of CEADESE graduates are either engaged by the industries or self-employed. The major milestones are in Teaching and Research Facilities Upgrade. The Centre has massively upgraded teaching and research facilities in order to improve on students’ learning outcomes. CEADESE had engaged in procurement of teaching, learning, and research facilities in the University. This includes upgrading and provision of internet and video conferencing facility for the University. Such facilities include NgREN, subscription to Ebcohost and Science direct, purchase of books for library, refurbishment and upgrading of Centre’s E-learning room, Centre Library, students’ hostels, farm structures and screen houses, and procurement of chemicals, research consumables and research equipment. 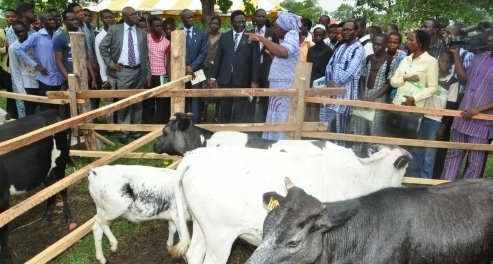 The University can now boast of an Africa Centre of Excellence Central Laboratory with first-class equipment comparable to other international laboratories to carry out research in Food Processing and Value Addition, Environmental Systems and Climate Change, Livestock Science and Climate Change, Crop Pasture Production, Agricultural Economics and Sustainable Policy and Agricultural Mechanization and Climate Change. The challenges are four-folds and the major one facing the Centre is sustainability. With Africa Centre of Excellence now firmly in place, the University has the onerous duty to ensure that the programme is sustainable. Firstly, we have embarked on aggressive fund generation in order to shore up the IGR base which the Centre intends to leverage on after the expiration of ACE funding. Secondly, we have responded to the ACE Impact Intervention which, if successful, will be very useful to sustain the momentum for three to five (5) more years beyond 2019. Thirdly, the state-of-the-art facilities have the capacity to generate funds if well managed. Another challenge is that of maintenance of facility. We have tried to pre-empt this, and to prepare adequately to overcome it. Firstly, we have ensured that the facilities have robust maintenance contracts. Secondly, solid agreements have been reached with the manufacturers of the facilities, especially the high-quality, very sensitive, and very expensive equipment, to train users and handlers. The training will include maintenance, replacement, and some levels of repairs. There is also the challenge of making sure that the programs do not lose relevance, continue to remain focused, impactful and attractive to even foreign students as it is presently. Firstly, we have built in some internal quality assurance mechanisms, Secondly; we are subjecting the programs to the first-of-its-kind international accreditation test to further cement its reputation and international recognition. Thirdly, the Centre has a network of national and international partners who are expected to sit on the Centre’s scientific board to review the quality of the program from time to time. The fourth challenge is to ensure that the programs run smoothly, seamlessly and without any interruption in fulfilment of the agreement reached with the World Bank at the commencement of the project.